And so that’s what I’ll do. This blog has been a thought of mine for years now. Cooking and sharing are two of the things I treasure most in life, so a blog would seem a natural fit for me, no? And so here I am. Because I’ve realized they’re right; I do have something to add. [In fact, we all do.] And I’d love to share it. The food I make is many things, but above all it is real, it is honest, and it is thoughtful… qualities I value in what I eat, but also in who I am, and who I work to be (imperfections included and accepted). And that just might be worth sharing, yes? I really hope so. So let’s get to it! 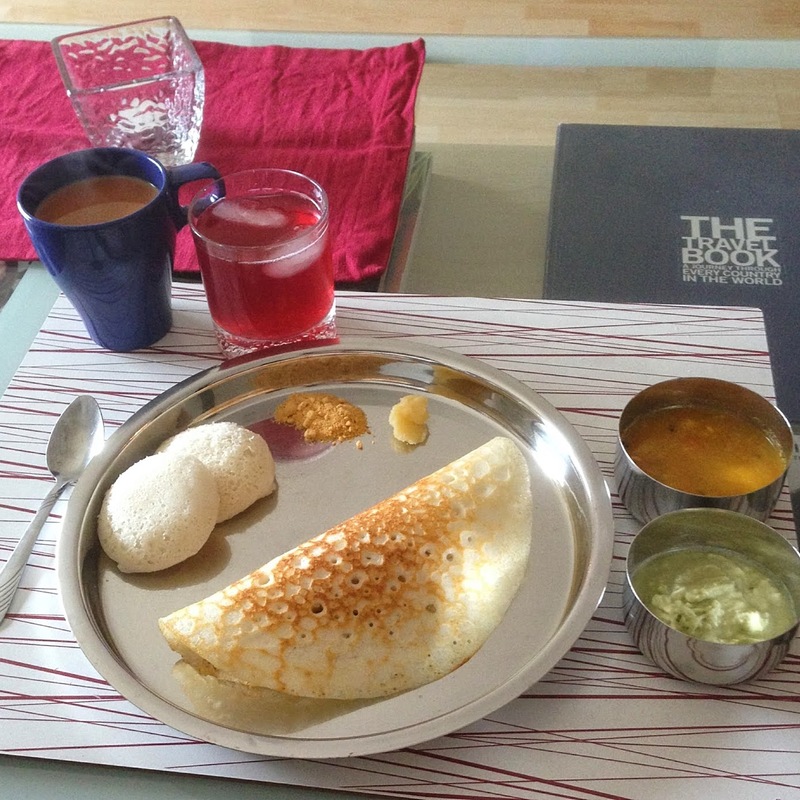 I’ve decided to start first with what is perhaps my favorite food on Earth: dosa/iddly. It’s a food that showcases many of the things I love—namely, breakfast, Indian food, and fermentation—and its flavor is like nothing else, so I’d say it’s an obvious first choice. Every time we go to India, it is the first thing I request. I don’t think I will ever tire of it. Dosa and iddly are two versions of the same product: a batter of ground and fermented rice and lentils. For dosa, the batter is used to make crepes, whereas for iddly, the batter is steamed into (savory) cakes. 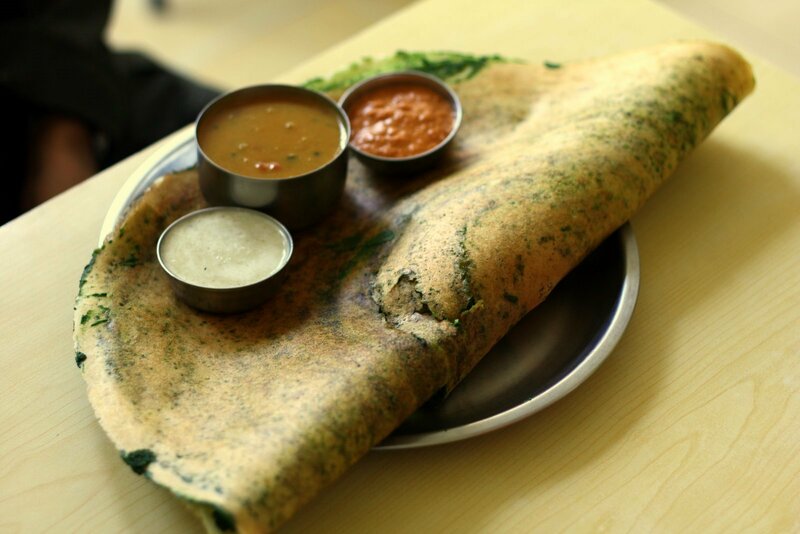 Dosa can be filled with a spicy filling (usually potatoes), and iddly is typically served with sambar and chutney. It’s a breakfast that has been a staple of Indian cuisine for centuries, and it makes sense why—it’s healthy, it’s fermented (read: easy on your stomach and good for digestion/your gut), and it is very inexpensive to make. One batch will give you at least three days of breakfasts. While this recipe is lengthy (I swear not all the recipes to come will be nearly as long! I just really want you get it right! ), the process is pretty simple: soak your ingredients, grind them in a blender, let them sit out and ferment (where they’ll get all bubbly and tangy and wonderful), and either cook them like crepes (dosa) or steam them into cakes (iddly). Place the iddly rice in one bowl, and the urad dal + fenugreek seeds in another. Rinse each once, then cover both with filtered water—the water should come up at least an inch or two over the grains. Allow to soak—on the counter, uncovered—for at least 4 hours. I typically start soaking around 11 am, so that I can blend together around 3 pm, then ferment overnight. Once soaked, you’ll need to grind each mixture separately. Start with the dal + fenugreek, adding enough of the soaking water to keep things moving. A high-speed blender like a Vitamix is ideal for this. You want the batter very smooth, almost silky in feel, so that when you rub some between your fingers, there is no grittiness. This takes at least a few minutes of blending, even in the Vitamix. It should look like a thick vanilla milkshake when it’s done. Transfer this batter to your fermentation vessel—I use my large le Creuset dutch oven to ferment in, though glass also works well (avoid metal). If all goes well, your batter will be nearly doubling in size, so you want something with room to spare. Repeat the grinding/blending with the rice and a bit of its soaking water (no need to wash the blender). It’s okay if the consistency of this batter is a little more gritty—like tiny, tiny pieces of sand—than the urad dal batter. Add this batter to the urad dal batter, then add the salt. Use your hands to combine the two batters and the salt. This helps pull in more wild yeast, and it also helps you gauge consistency: You want the batter to pour off your fingers like thick cream. It should come off them in a nice stream, not like water, but not thick like yogurt. Once combined (and you’ve washed your hands), take note of your batter line—ideally you want the batter to rise well above this, so you could mark the outside of the container with a piece of tape or marker if you don’t think you’ll remember. Cover the vessel lightly. You can use cloth, plastic wrap, or even the lid if it allows for a little air flow but still keeps the warmth in. I use plastic wrap and then cover with a light cotton dishtowel. Move the vessel to a very warm place (75 to 80 degrees is ideal) and allow it to ferment for 12 to 18 hours. I put mine in the cupboard above the refrigerator and it works like a charm, usually taking about 17 to 18 hours for a hefty rise. It seriously feels like Christmas morning to me waking up to see if my batter has risen! But maybe this is just me. Once your batter has risen, it should look crazy bubbly and beautiful (see photo at the top of this post). It will also have a slightly tangy smell. If nothing has happened, cross your fingers and give it some more time. Sadly, if it never rises, it’s hard to save things and I recommend starting over, considering the suggestions mentioned in my Notes below. Assuming things have worked, congratulations!, it’s time to make your iddly and dosas! I like to steam a few iddly first (usually about 16—they’re small and you’ll have a lot of batter), then use the rest to make dosa. To make iddly: You will need a steamer for this, and some sort of small cups (like ramekins) to steam them in. You can also buy an iddly steamer for relatively cheap if you plan on making them a lot–I think I got mine for about $15 from the Indian grocery store. Either way, grease your molds with a little oil or ghee and gently scoop out some of the batter, filling to about 3/4 of the way full. You really don’t want to stir down or crush those beautiful bubbles in the batter—they are what make the iddly taste like little clouds. Be gentle. Steam the iddly for 12 to 15 minutes—you will know they’re done when (after cooling down for a minute), you touch the top and it feels dry. Leave in their molds for a few minutes before removing. To make dosas: Stir down the batter and add a bit more salt (1/4 to 1/2 teaspoon maybe). You may also need to add some water–the consistency should be somewhere in between crepe batter and pancake batter. It should pour easily off a spoon. Heat a pan on the stove to medium heat. I use two cast iron flat griddle pans, which are perfect because they hold the heat well and also don’t have tall sides that interfere with spreading. The also make the dosa nice and crispy. You can use non-stick if that’s all you’ve got. Spread a little oil onto the pan, then take a ladleful of the batter (about 1/4 cup), and pour it in the center (remember, the pan needs to be hot so that batter “sticks” immediately). Using the bottom side of the ladle, spread the batter out into a larger circle, working from the center out, and always in the same direction (clockwise or counterclockwise). You want the batter spread really thin. This takes practice but don’t fear! You’ll get the hang of it. I watched so many youtube videos before mastering it myself that I should probably send those people a check. Allow the dosa to cook for a minute or so, sprinkling a little oil around the edges as needed. It should brown and release itself from the bottom of the pan on its own, or with just a little bit of help from your spatula. I typically do not cook the other side because it doesn’t need it, but if yours is thick and you think you need to, go for it. Serve the dosas (and the iddly) hot with whatever spicy curry, dal, or chutney you like. We always go with the classic: turmeric-spiced potatoes and coconut chutney, along with some ghee. Perhaps I’ll cover those in a future post …but for now, enjoy the fact that you’ve mastered perhaps the most quintessential Indian breakfast dish! Leftover dosa batter can be refrigerated and used for at least a week. Leftover steamed iddly freezes superbly—one of our favorite quick breakfasts is to slice the thawed iddly in half lengthwise and shallow fry them in a little oil. Iddly rice is not the same as regular rice. It is parboiled and very short-grained. Without going into too many science-y details, it’s much better for dosa/iddly because of the proteins it contains. All of these items are available at all Indian grocers–and for cheap cheap cheap! Stored well, they’ll last for months. Just look for skinned, whole urad dal if you can (it’s white and round). Like the iddly rice, it’s better for dosa than the split, unhusked version. Ask for help if you’re not sure—the staff should know exactly what you mean and will be happy to assist. You may feel intimidated at first, but I promise you no one cares if pronounce something wrong, or spend an hour meandering the aisles (speaking from experience here…). Do not over-rinse the grains; you don’t want to wash away all those wild yeasts already on the rice and dal! Use the fenugreek seeds—these aid in grabbing extra yeast from the air. Pretty sure this tip has been around for hundreds of years. Indian grandmothers never steer you wrong. Leave your bowls uncovered when soaking; again, more opportunities for new microbes to join the party. Better yet, leave the bowls near a houseplant, as they usually have good wild activity to draw from. If you have sourdough starter handy, consider adding a spoonful to the soaking water as well—I find this immensely helpful in kickstarting life. The first dosa I ever had in India. On the drive to Agra (home of the Taj Mahal), we stopped at this tiny little restaurant connected to a gas station, in the middle of nowhere. I ordered this spinach dosa and that.was.it. Life, fulfilled. I don’t think even a southindian would have explained the method better Amanda:)I like the Christmas morning part.amazing writing up. Which brand pan are you using to make the dosa. I am switching between Le cruset crepe pan and lodge cast iron pan. Any help would be good. I use a very old cast iron pan, passed down to me from my mom. Both of yours sound like they should work! With my cast iron, I have to just be sure not to mess with the dosa until I can tell it’s lightly browned and pulling away from the pan. Otherwise it can stick. Good luck! Thanks so much for your reply :).